OSHKOSH, WI, July 20, 2018 – Meet the women leading major spacecraft systems development for NASA, laying the groundwork for humans to go back to deep space for the first time since 1972. 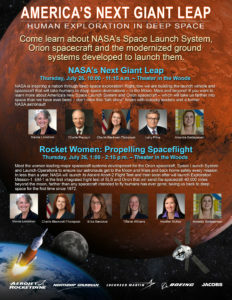 The Rocket Women are part of the leadership team that will return humankind to the Moon – and eventually to Mars. Hear what they have to say about NASA’s human exploration efforts at the Propelling Spaceflight panel discussion, and have the opportunity to ask in-depth questions immediately following the panel.